The CFPB released guidance, resources and tips to help real estate agents and brokers prepare for the new regulation. Preapprovals and prequalifications are unchanged; loan estimates and intent to proceed will be part of the new process. Changed circumstances will require revising loan estimates, but extra three-day reviews are unlikely. With about six weeks to go before the Consumer Financial Protection Bureau’s (CFPB) TILA-RESPA Integrated Disclosures (TRID) rule takes effect, the bureau is offering guidance, resources and tips to help real estate agents and brokers prepare to comply with the new regulation. Released by the CFPB in November 2013 as part of its “Know Before You Owe” consumer financial education initiative, TRID consolidates four consumer disclosures currently required under the Truth in Lending Act (TILA) and the Real Estate Settlement Procedures Act (RESPA) into two forms, a Closing Disclosure form and a Loan Estimate form, each of which must be provided to consumers by certain deadlines. These changes take effect on Oct. 3. Whatever jargon you choose to use, here are seven aspects of the new rule that every agent should know and understand right now. 1. Preapprovals and prequalifications are unchanged by the rule. Things agents should know about TRID: Preapprovals and prequalifications are unchanged. The rule does not make changes to preapprovals or prequalifications. However, the CFPB advises that your clients are likely to have a smoother path from contract to closing if they invest time and effort in learning about mortgage loans and understanding what kind of financing they qualify for prior to selecting a home. Ideally, before they select a home, clients will have talked with one or more lenders — or even homeownership counselors — and have decided on the specific type of loan that will best meet their needs (for example, conventional vs. FHA). If they feel confident they will be able to obtain financing, this will enhance their ability to request and receive meaningful Loan Estimates for comparison, the CFPB says. 2. The application process begins with a Loan Estimate. Things agents should know about TRID: The application process begins with a Loan Estimate. The application process will typically begin after your client has identified a property. Lenders must provide Loan Estimates within three business days after your clients have provided that lender with their name, income, Social Security number, address of the home they would like to purchase, an estimate of the home’s value (usually the sales price) and the amount they want to borrow. The lender must provide the Loan Estimate within three business days, but there is no set time frame for your client to receive it. In other words, if the lender mails the Loan Estimate, your client may receive the Loan Estimate more than three days after their application. Currently, comparing multiple loans may be cumbersome because each lender might have different requirements, including extensive written documentation. But after TRID takes effect, although lenders may accept and consider income verification documents and other information voluntarily provided, they cannot require this documentation as a condition of providing a Loan Estimate. As a result, your clients should have a much easier time getting and comparing Loan Estimates from different lenders, the CFPB says. Issuing a Loan Estimate does not mean that the lender has approved or denied the loan. By issuing the Loan Estimate, the lender has only committed to honoring the fees described in the Loan Estimate, as long as the loan is later approved without any changes in circumstance affecting the loan application. 3. Your clients must indicate their intent to proceed. Things agents should know about TRID: Your clients must indicate their intent to proceed. After your clients have compared Loan Estimates and determined which loan best meets their needs, they need to let the lender know. If they are silent, the lender cannot assume they intend to proceed. In that scenario, lenders can’t charge any fees in connection with the mortgage application, including an application or appraisal fee. The only exception is a reasonable fee for the credit report. Lenders can’t even request credit card information or a post-dated check to be charged or cashed later until the client states his intent. 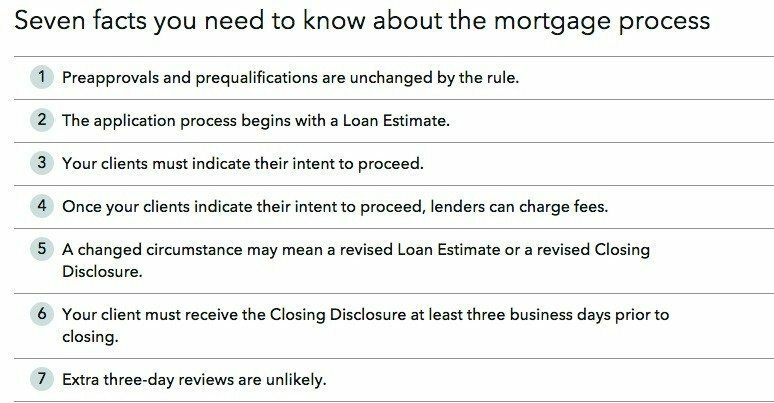 Different lenders may have different requirements for what your clients need to do to indicate their intent to proceed. If 10 business days pass without the client stating an intention, the lender is no longer required to honor the terms offered in the initial Loan Estimate. If that happens, the lender will close the application — and your clients will have to start over from the beginning. 4. Once your clients indicate their intent to proceed, lenders can charge fees. Things agents should know about TRID: Once clients indicate intent to proceed, lenders can charge fees. Because lenders cannot collect payment information in advance, they may require your clients to provide payment for an appraisal, application or other loan processing fee immediately after or as a part of confirming the intent to proceed with the application. Lenders may require payment before beginning the appraisal, processing, verification or underwriting processes. 5. A changed circumstance may mean a revised Loan Estimate or a revised Closing Disclosure. Things agents should know about TRID: A changed circumstance may mean a revised Loan Estimate or Closing Disclosure. There may be some instances in which the lender will have to issue a revised Loan Estimate or Closing Disclosure — the CFPB refers to these instances as “changed circumstances.” Not all changes require the lender to issue a revised Loan Estimate. Minor changes, such as when the seller agrees to pay for a specific cost not included in the original agreement, do not require the lender to issue a revised Loan Estimate. But significant changes most likely do, the CFPB cautions. Some of the more common reasons a Loan Estimate may be revised include: a client deciding to change loan programs or the amount of the down payment; the appraisal on the home came in higher or lower than expected; a client’s credit status changed, perhaps owing to a new loan or a missed payment; or the lender could not document overtime, bonus or other income provided on the client’s application. 6. Your client must receive the Closing Disclosure at least three business days prior to closing. Things agents should know about TRID: Clients must receive Closing Disclosure at least 3 business days prior to closing. The CFPB’s intent here was to eliminate any significant changes from the lender that put pressure on clients to sign on the same day. The Closing Disclosure can be compared with the information contained in the initial or a revised Loan Estimate (or, in the case of a revised Closing Disclosure, the initial Closing Disclosure). Flexibility has been built into the rule to accommodate small, last-minute changes typical of purchase transactions. However, when changes to the transaction are significant, a new three-business-day review period is required. Since large, last-minute changes should be rare, an additional review period should also be rare, the CFPB says. To provide a Closing Disclosure three business days before the closing that reflects all of the terms of the transaction, settlement agents and creditors need as much information from the buyer, the seller and the agents about the transaction as far in advance of closing as possible. At the same time, most settlement issues, such as adjustments to seller credits to account for repairs that are currently addressed as late as the day of closing, can continue to be handled at closing without requiring a new three-business-day review period. The Closing Disclosure must contain the buyer’s and the seller’s real estate brokerages’ and agents’ names, addresses, state license ID numbers, email addresses and phone numbers. If this information is unknown, the form can’t be completed. You need to communicate this information to the lender to prevent any delays. 7. Extra three-day reviews are unlikely. Things agents should know about TRID: Extra three-day reviews are unlikely. The annual percentage rate (APR) increases by more than 1/8 of a percent for regular loans (most fixed-rate loans) or 1/4 of a percent for irregular loans (most adjustable loans). A decrease in APR will not require a new three-day review if it is based on changes to the interest rate or other fees. Lenders have been required to provide a three-day review for these changes in APR since 2009. Your clients generally may not waive their right to this review period. For more information and guidance on how to handle mortgage transactions after Oct. 3, visit the CFPB’s resource page.